Its the undeadliest game! Big money zombie shoot! and yes, 'The Most Dangerous Game' has been lifted many times (like 'Surviving the Game' with Ice-T, and the early 'Most Dangerous Game' from 1932 which you can watch here). 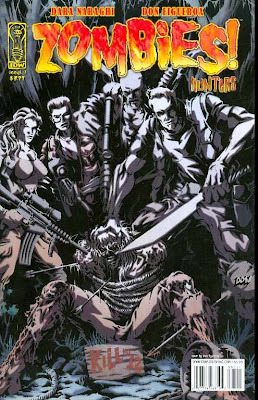 This comic uses all the conventions of this concept (the wealthy hunters, the remote island) and throws some Voodoo magicked Zombies in as the prey. These zombies seem pretty resilient though, and you get the sense that some of these big time, big game hunters are going to get theres sooner rather than later (maybe one of the rednecks or the Internet entrepreneur for starters??). The art is a major plus factor, especially the portrayal of the zombies as pumped up, fearsome killers, as opposed to shambling, pathetic cannon fodder. So what if it is another riff on the Zombie genre, and the concept of big money, illegal hunting humans is not very original? This issue manages to get the scene setting out the way quickly enough to see some major action at the end, with a great 'Zombies Lake' pay off at the end. What's not to like?? Review - loved it. Trashy, fun and action packed, with great artwork. 9 out of 10.